The solution of Partial Differential Equations (PDEs) is one of the most important problems of mathematics, and has an enormous area of applications. One of the methods for extending the range of analytically solvable PDEs consists in transformations of PDEs and the corresponding transformations of their solutions. Thus, based on the fact that a second-order equation can be solved if one of its factorizations is known, the famous method of Laplace Transformations suggests a certain sequence of transformations of a given equation. Then, if at a certain step in this transformation process an equation becomes factorizable, an analytical solution of this transformed equation — and then of the initial one — can be found. 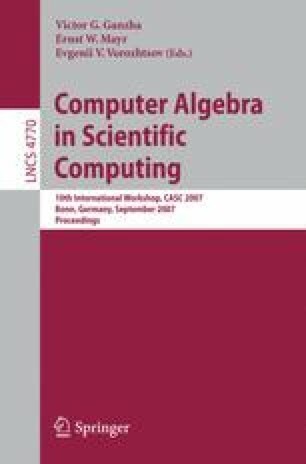 The aim of this talk is a description of some old and new developments and generalizations of analytical approaches to the solution of PDEs and the corresponding algebraic theory of differential operators. Recently we have introduced the notion of obstacle for the factorization of a differential operator, i.e. conditions preventing a given operator from being factorizable. These obstacles give rise to a ring of obstacles and furthermore to a classification of operators w.r.t. to their factorization properties. From obstacles we can also get (Laplace) invariants of operators w.r.t. to certain (gauge) transformations. We have shown how such systems of invariants can be extended to full systems of invariants for certain low order operators. Another related problem is the description of the structure of families of factorizations. For operators of order 3 it has been shown that a family of factorizations depends on at most 3 or 2 parameters, each of these parameters being a function on one variable.